PULLMAN, Wash. – The public is invited to a planting ceremony for a small tree with a big history at 2:30 p.m. Tuesday, April 22, at the Washington State University Arboretum and Wildlife Center. The location is on Terre View Road between the Moscow-Pullman Highway and Grimes Road. The sapling originated from a butternut tree planted more than 165 years ago by George Washington Bush, an American pioneer who settled in the western territory that would eventually become Washington state. George Washington Bush butternut tree in Tumwater, Wash.
Stan Wills, a retired naval senior chief and history buff, will deliver a brief presentation about Bush. Historical re-enactors will conclude the event with a salute using replicas of 18th century muskets. 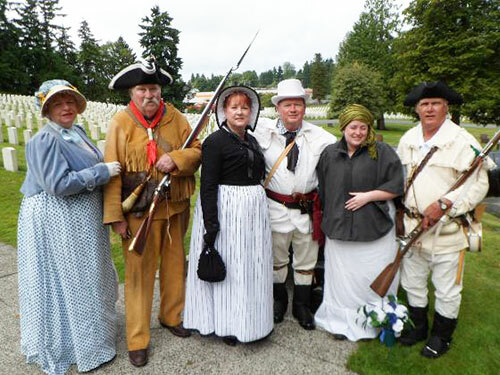 Wills is president of the state chapter of the Sons of the American Revolution and genealogist for the Washington State Society of the War of 1812. He donated the butternut tree to WSU’s College of Agricultural, Human and Natural Resource Sciences (CAHNRS) because of the historical association between the university and Bush. “In 1890, George Washington Bush’s eldest son William Owen Bush, who served two terms in the Washington state Legislature, introduced the bill to establish what would become Washington State University,” said Wills. Members of the War of 1812 Society. 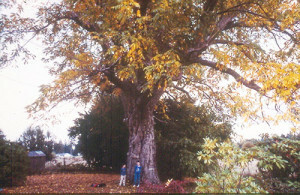 The tree traveled to Pullman from Tumwater, Wash., the location of the Bush Prairie Farm and the oldest butternut tree in the United States – and likely the world, according to Michael Dolan, the owner of Burnt Ridge Nursery in Onalaska, Wash. Dolan propagated the tree from one of the walnut-like fruits of the original Bush tree. Ron Mittelhammer, interim dean of CAHNRS, will host the dedication. For more information about the tree and George Washington Bush, as well as directions to the planting site, visit http://www.arboretum.wsu.edu.